GM has enjoyed a double-digit rally in 2017, but that party may be coming to an end before 2018 rolls around. The critical price level to watch is $41. General Motors (GM - Get Report) could re-enter the European market, according to CEO Mary Barra. It's been less than a year since GM sold its European unit to France's PSA Group, amid weak car sales in the Eurozone. Now, investors are wondering what a re-entry to Europe might look like for the U.S. auto giant. For one, it wouldn't look as if it did. As GM invests heavily into electric and self-driving car tech, it's likely a return to Europe would focus on tech-heavy, non-mass-market vehicles. While a more restrained return to Europe could offer a material revenue boost down the road, investors -- and GM's share price -- are unmoved. That's at least in part because of the price action that's been taking shape in this automaker for the last two-and-a-half months. Simply put, after charging nearly 20% higher in 2017, GM's price action is waving some serious red flags. It's editorializing a bit to simply say GM is up 20% year-to-date. 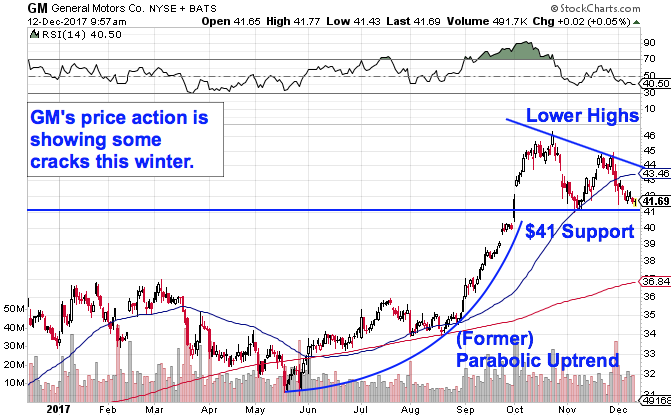 A quick glance at this stock's chart shows that GM's double-digit rally has been anything but linear. This stock started the year in correction-mode, shedding around 7% of its market value in the first four months of the year. All of this stock's upside has come since mid-May. And while that recent rally has slingshotted shares higher in a parabolic uptrend, it peaked near the end of October. Since then, GM's price action has looked "toppy". GM is currently forming a descending triangle pattern, a bearish price setup that typically acts as a continuation pattern after a prior down-move. The descending triangle is formed by horizontal support down below shares at $41, with downtrending resistance to the top-side. Basically, as this stock pinballs in between those two technically meaningful price levels, GM's shares have been getting squeezed closer and closer to a breakdown through that $41 price floor. If and when that happens, we've got a clear-cut sell signal in GM. Relative strength is an important side-indicator in GM's price trajectory right now. The indicator (not pictured), which measures GM's performance vs. the rest of the broad market, has been in a downtrend of its own since shares peaked in October, signaling that GM is materially underperforming the S&P 500 at this point. From a statistical standpoint, that sort of underperformance typically begets more underperformance on a three-to-six-month time horizon. That doesn't bode well for GM in the final stretch of 2017. Bottom line: If GM violates $41 this week, you don't want to own it anymore.